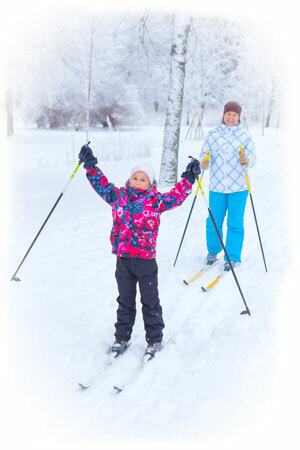 The Arrowhead Nordic Ski Club offers programs for almost all ages, abilities and motivations. You have several options if you want to register for these programs. Please go to our program registration page to find out how! Cross Country Canada’s Skill Development Program provides three levels of skier development opportunities for children – Bunnyrabbits, Jackrabbits and Track Attack. The overall objective of the program is to assist children in the development of a love of the outdoors, a healthy lifestyle, excellent technical skills and a good level of physical fitness within a sport environment. Bunnyrabbit Program (4-5 years) is designed to introduce cross-country skiing through organized activity and active play. Children make ski friends, develop fundamental movement skills and have fun! Jackrabbits (6-10 years) is designed to teach basic cross-country ski skills (both classic and skating), help children develop confidence, provide children an opportunity to ski and socialize with their ski friends, instil a lifelong interest in the sport and have fun. Each level includes an enrollment kit, a poster that provides a comprehensive record of the young skier’s ski career and award stickers to chart the different levels of achievement. Fruit, hot chocolate and cookies provided every week! Bunnyrabbits and Jackrabbits run for 8 Saturdays or Sundays typically beginning the first week of January and are taught by qualified instructors. Choose from Saturday morning or afternoon classes, or Sunday morning classes. Track Attack Lynx is a program for ages 9-12 who are new to skiing and have not participated in Jackrabbits in the past (or completed Jackrabbits Level 4) but would like to begin developing their skills. This program will serve as a link between Jackrabbits and Track Attack for those who would like to join the sport in a less demanding environment than Track Attack. This program will begin from the ground up, providing beginner training and skill development so that the athlete may join Track Attack as soon as their skill level allows and no longer than one season after they begin the program. Track Attack Lynx starts with Jackrabbits in early January and will run from 10-12 on Saturdays for 8 weeks. Track Attack is a 3 year program that builds on Jackrabbit training. Lessons run on Saturdays with optional Tuesday nights throughout the winter season. The Track Attack athlete will develop confidence in all aspects of the sport in either recreational skiing or racing (the focus is up to your child). Skills are developed through games, play, and direct instruction. Prerequisite is Jackrabbits Level 4 or Lynx. Before the snow – training sessions to be announced. The ARC program enables skiers to improve their fitness and skiing in order to compete in cross country ski racing This group trains year round and includes weekly off-season training sessions, training camps and biweekly on-snow instruction. It is designed for athletes interested in racing at the Ontario Cup or Masters Cup levels, but is also suited to skiers wishing to compete in friendly loppets and younger athletes who are considering racing at higher levels but are not quite ready yet. Athletes have access to roller skis, classic skis, slider mats and roller boards. Coaching and waxing support is provided at O-Cup races. Ages 11 to adult. This friendly, non-competitive class is for adults who want to improve their skiing and fitness at their own pace and level. (This is NOT a program for ―hardbodies‖ only!) Choose from classic or skate instruction, or both. You’ll also meet other skiers and have fun! Runs on Saturday afternoons. Interested in a Masters Ski program for adults? Masters skiing is generally for ages 30 to 90+!, but it is also open to young adults under 30 as well. Skiing – practicing both ski techniques, race preparation, waxing, racing. Racing: coaching and waxing support but no waxes provided!